I HAVE ALWAYS suffered with PMT – that’s Pre-Match Tension, but the week leading up to the Liverpool game was just murder. I couldn’t concentrate, I couldn’t sleep, I was distracted, my nerves shot to pieces with the thought that we could have got so close and throw it away for the third and final time at Anfield. We got to Liverpool early and it seemed that every Chelsea fan was in the same state as I was – we all looked for re-assurance from each other but all that greeted us was other haunted, unsure faces. So it was great to bump into Steve Kelly who was so matter of fact about his certainty of a Chelsea win that it restored my faith enough for me to pull myself together, go into the ground and do my part in singing my head off. Much had been made of the fact that the Scousers wanted us to win to prevent United over-taking their record, and it was true that the majority that we met favoured a Chelsea victory. But the general feeling was one of a hugely disappointing season which had stumbled along to the point where, in truth, they didn’t care what the result was as it made no difference to their season at all. They were quiet going in, quiet in the ground on the whole, and quiet on the way out. Given my previous visits to Liverpool it was a bit of a surreal experience to be honest. By beating Liverpool I think we overcame the psychological barrier that was in our way. Now that has been conquered we cannot allow our concentration to waver against Wigan. We have a better team and everything points to a Chelsea win, but as we all know, football doesn’t always follow the script. So although many of the fans were singing “we’re gonna win the league” (I wasn’t one of them), Ancelotti hit exactly the right chord I thought with his post match interview – pleased with the result, confident about Wigan but not complacent. Amazing really that we are on the cusp of a potential Double but many fans (myself included) do not know what to make of Ancelotti. Is he an inspirational manager or just incredibly lucky – or a bit of both? Who cares as long as he can keep it up. 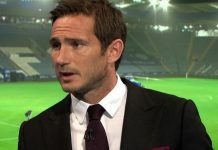 If he does manage to do the Double in his first season he would once and for all bury the ghost of Mourinho which still stalks Stamford Bridge and he would rightly take his place as a Chelsea legend. Wigan are no push-over and even as I write this the nerves have started jangling again. They have demonstrated on more than one occasion this season that they are more than capable of upsetting the apple cart and most of us can recall with a shudder how a last minute goal by Emile Heskey derailed a spirited chase of Manchester United in the Avram Grant season. As recurrent nightmares go it’s up there with Steve Guppy’s late equaliser for Martin O’Neill’s Leicester in the 1999 Vialli campaign and the raw wound of Andres Iniesta 12 months ago. But hopefully with nothing left to play for and a good number of their players off to the World Cup we can do what is necessary. And if we don’t, we don’t deserve the title anyway – harsh but true I’m afraid. But I am confident after the display against Liverpool – it wasn’t a classic display, but the team knew what they had to do and they went out and did it. It has obviously finally sunk in that there are no second chances, time has run out for that so they need to do it right first time. It strikes me as somewhat ironic that Ancelotti was brought in by Abramovich because the Russian thought that the Italian could win him the Champions League, but in fact we crashed out early which more than possibly concentrated our minds on where they should be – i.e. the Premier League title. I am a traditionalist and a purist and the Double to me would be worth more than winning the Champions League three years on the bounce. Perhaps you can become blasé about your domestic league if you’ve won it 18/19 times but we have a long way to go before we get to that stage. As I alluded to last week, the fact that we are even on for the Double is mind-blowing for someone like me. I feel privileged to witness a Chelsea team making history, watch players who are transcending to legend status – who will be remembered by future generations of Chelsea fans just as we revere the likes of Osgood and Greaves. So just two more hurdles to negotiate to achieve Chelsea immortality and join the English footballing elite. The players look confident, the scything down of Liverpool ensured that confidence surged through the majority of the supporters too so its just a case of everyone keeping their heads, doing their job to the best of their ability and giving the English media their worst nightmare – the job of writing a positive piece on Chelsea.